Although cities are often already warmer than their rural surroundings (the well-known “urban heat island” effect), heat waves (HWs), excessively hot periods, will not only enhance the urban and rural temperatures but also exacerbate the contrast between them (Li et al 2015), leading to aggravated thermal stress on urban dwellers (Sun et al 2016). I spent this summer in Beijing and experienced several sultry days in July, which, again, provided me with more sensible HWs than those HW papers I’ve been working on. As September came, Beijing began to cool down; this reminds me of the very cool summer in Reading last year (at least to me). So it seems a good time for a quick review of HWs in Chinese mega-cities of the past decade (2007–2017). The megacities examined here are those with population larger than 5 million (MoHURD of China, 2016); there are 20 of these, with Shanghai, Beijing and Chongqing the top three populous mega-cities. Temperature observations from the Integrated Surface Database (Smith et al 2011) are employed in this work; however, due to the insufficient data continuity (i.e., consistent records shorter than 30 yrs), two cities (Hong Kong and Shenzhen) are excluded. As such, the following review is only for 18 Chinese mega-cities. First, let’s look back at the highest temperatures experienced by these cities during the past summer (Figure 1). 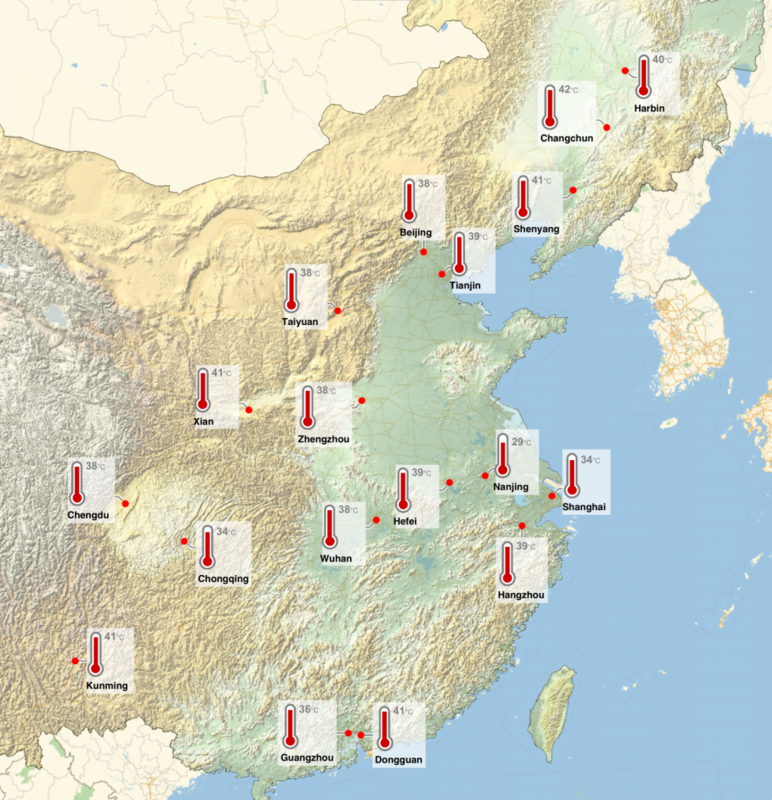 Unsurprisingly, records over 35 °C (high temperature according to the Chinese Meteorological Administration, CMA) were recorded at all sites (except for Nanjing, very suspicious records here!) even with highs over 40 °C for several of them. Figure 1. Daily maximum temperature of 18 Chinese mega-cities recorded during the 2017 summer months (JJA). Then we move on to the HWs. Although CMA define a period with three or more consecutive days with daily maximum temperature (Tmax) over 35 °C as a HW event, given China is vast country with diverse climates, a location-specific approach (Meehl and Tebaldi 2004) is adopted here for HW identification. With T1 the 97.5th percentile of the observed series and T2 the 81st percentile, a HW is defined as the longest period that satisfies the following conditions: (1) Tmax > T1 for at least 3 days; (2) for the entire period; and (3) Tmax > T2 for the entire period, where Tmaxbar denotes the average of Tmax over the HW period. A total of 973 HWs occurred during the past decade in the 18 mega-cities (Figure 2); in 2009, 2010 and 2017 all the 18 cities experienced HWs. Also, Hefei, Kunming, Changchun, Harbin, Hangzhou and Wuhan experienced HWs all the way through the past ten years, followed by Xi’an, Chengdu, Nanjing, Beijing and Shanghai that recorded HWs in nine of the ten years. Figure 2. Occurrence of HWs (denoted by empty dots) of 18 Chinese mega-cities between 2007 and 2017. By looking into the annual HW characteristics, we find more interesting facts. Regarding the annual frequency (i.e. 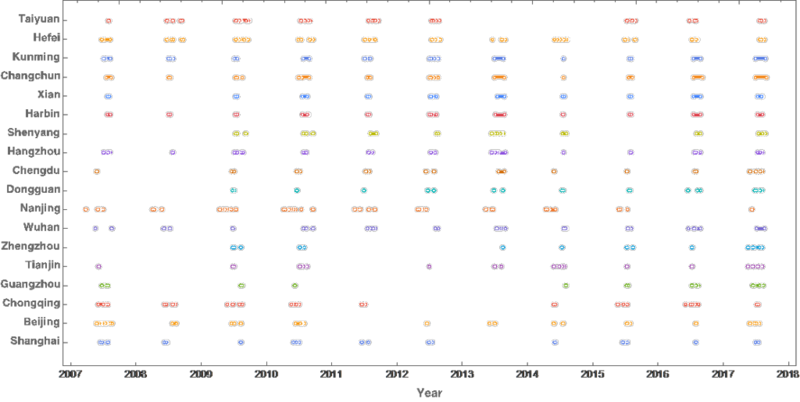 number of HWs per year, Figure 3), 2009, 2010 and the very recent 2017 generally observed more HW events compared with other years. And, solely based on the trend, 2017, similar as 2009, looks to be on an upslope to more HWs. Figure 3. Annual HW frequency of 18 Chinese mega-cities between 2007 and 2017. The facts revealed by annual HW durations (i.e., number of HW days per year, Figure 4) are more striking. In addition to 2010 and 2017, 2013 emerges as another “significant” year; this is particularly true to me: I was in Zhejiang that year for the whole summer and underwent highs of 40 °C almost every day! By comparison with the HW frequency, it is clearly shown that HWs of 2013 were even stronger than those of 2010: though with fewer events, HWs persisted longer in 2013. Furthermore, 2017 outperformed other years with the most HW days. Figure 4. Annual HW duration of 18 Chinese mega-cities between 2007 and 2017. Following the successive warmest 2015 and 2016 since modern record keeping began in 1880, will 2017 hit a new record? Although an answer to it is not clear yet, this quick review (a far from a thorough investigation) highlights 2017 for the Chinese mega-cities as a remarkable year with the most annual HW days in the past decade. And, if such trend continues, it looks we will “welcome” more HW days in the coming years. This entry was posted in China, Climate, Climate change, Environmental hazards, Waves, Weather. Bookmark the permalink.